Shuffle the deck of Concept cards and place it face down, then create a pile of 12 Double VP tokens and lots of Single VP tokens. Place the pawns and cubes in the bowl: They are valuable tools for guessing the words! Now determine in some manner the two neighbors at the table who will form the first team. 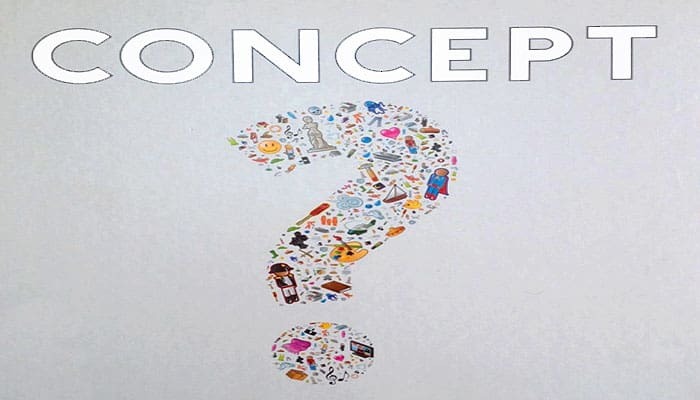 The team draws a Concept card and selects a word or phrase from the list that the other players will guess. For your first few games, we recommend that you choose an Easy word. Note that Challenging words require mastery of the game by all players. Place the main concept pawn first to represent the word to be guessed, then place cubes of the same color to clarify this main concept. Then if needed or desired, develop sub-concepts by placing additional pawns and their correspondingly colored cubes. The first player to find the solution wins 1 Double token (worth 2 VPs) while each member of the team whose word was guessed wins 1 Single token (worth 1 VP). Then the next two players clockwise around the table take a new card to choose a word for others to guess. 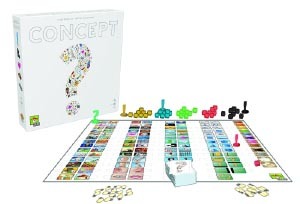 The other players can try to guess the concept as often as they wish. The team members can say "yes" when others give a good answer or are following the correct line of thought, but they cannot otherwise communicate directly with the other players. The order in which the team members place cubes on the board can be important. Don't hesitate to remove the cubes and place them again to emphasize the order in which they appear. The team members should talk and consult with one another discreetly as they might not be thinking along the same lines when it comes to giving clues. The team members are free to place the cubes as they wish; they are NOT obliged to take turns when doing so. The team members can use as many pawns and cubes as they want to aid others in guessing the word, but they should be careful not to confuse the other players with too much information. There are no limits or penalties for the number of pieces used. After some time, if no one guesses the word, the team members choose a third player to assist them. If despite this helping hand, no one can guess correctly, the players abandon the word and no one scores any points this round. 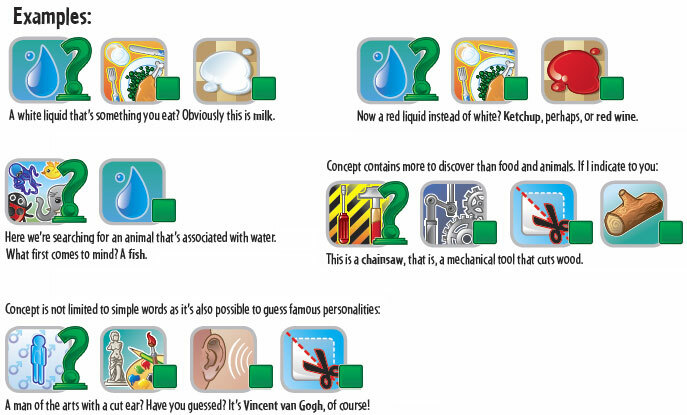 The player aids contain a non-exhaustive list of meanings for the universal icons. Feel free to read the descriptions to discover the wealth of possible meanings. 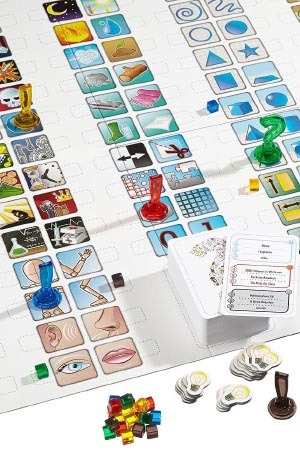 If the other players are lost, the team members can choose to wipe the board clean of pawns and cubes, then restart their clue-giving along a different path. Once the 12 Double VP tokens have been claimed, the game ends. The player or players who have scored the most VPs win the game.